Have you ever thought of having your own logo or crest on some plates, or on a dinner service? 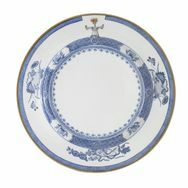 We could design a modern take of a wonderful old china or porcelain design for you. You could equally have a traditional or more modern pattern on Chinese Hard Paste porcelain, or alternatively on English Bone China. Please feel that you could discuss a commission like this exploring all possibilities in order to get an estimate of cost and time. The photos show examples of bespoke plates, and the sketch design shows a recent proposal for a client's dinner service.